Uuuugh…horses. I have a daughter who enjoys occasional horse rides, but she has an aunt with horses (which is just fine with me). Yes, I can see and understand the appeal. Horses are beautiful, graceful, powerful and really nice to observe grazing in pastures from afar — as long as those are not my pastures and I am not paying for their feed/veterinary/tack/saddle/etc./etc./etc. bills. In my estimation, horses are sort of like the boats of the animal world — they are kind of fun as long as they are owned, cared for and maintained by someone else. Despite numerous equine challenges, though, there really is something special about pairing young people with animals and in some cases horses are the perfect fit. And, when horses and young people are combined with some caring expertise (along with ample funding and many hours of hard work) some really amazing things can happen. Such is the case with Riders Unlimited, Inc. in Oak Harbor where the therapeutic benefits of horses are harnessed for individuals at least four years old who have been diagnosed with a disability and referred by their physician to participate. Some of the disabilities that benefit from Equine Assisted Activities and Therapies (EAAT) are Attention Deficit Disorder, Attention Deficit/Hyperactivity Disorder, Cerebral Palsy, CVA/stroke, developmental disabilities, hearing and visual impairments, learning disabilities, Multiple Sclerosis, Muscular Dystrophy, seizure disorders, sensory integration, Spina Bifida, and traumatic brain injuries. The benefits of working with the horses allows Recker and the more than 40 Rider Unlimited volunteers to really impact the lives of the young people who participate. Riders Unlimited was created in 1996 and the 10-acre facility features a full indoor riding arena and stalls for 20 horses. Recker is the only full-time staff. The kindness of donors and sponsors is critical for Riders Unlimited. Riding horses makes for excellent therapy because it adds a strengthening element while also helping to motivate patients to undergo treatments. Horses exhibit social and responsive behaviors similar to humans, which makes it easy for clients to connect with them, Recker said. Spending time working with horses also provides opportunities for Riders Unlimited clients to learn about trust, respect, honesty, and communication. Because horses use mostly non-vocal communication and are in-tune with human behavior, participants learn to better understand how non-verbal communication might be influencing others in their lives. In addition, horses require people to be aware of their surroundings at all times and that heightened awareness is important in order to reveal patterns of behavior and helps participants think in a new way, Recker said. Mary Stricker’s son has been riding for 16 years since he was 11 and the benefits of his time spent at Riders Unlimited have been life changing. Fair season is almost here and, more than most, the readers of this publication understand how valuable working with livestock can be for young people. There is incredible value in time spent working in the barn with animals — even when the dollars and cents don’t quite add up. For some of the visitors, Riders Unlimited offers a rare chance at finding a connection with animals in a truly meaningful way. And in the right setting, horses have the unique gift of bringing smiles to some young people who may not have all that much to smile about otherwise. There are plenty of people who really love horses. I am not one of them. But their incredible value for these young people can even make a hard-hearted-horse-hater like myself rethink things a bit — an equine opine definitely worth some consideration. 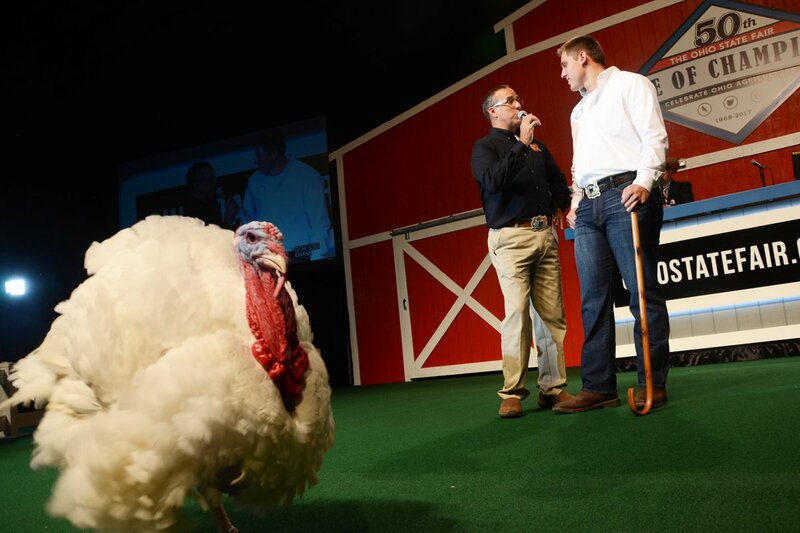 The Grand Champion Market Turkey was exhibited by Milan Pozderac of Knox County and sold to Ohio Harness Horseman’s Association, Cooper Farms and Kale Marketing for $15,000. Riders Unlimited, Inc. in Oak Harbor uses the therapeutic benefits of horses to benefit individuals at least four years old who have been diagnosed with a disability and referred by their physician to participate.